An undercover FBI agent becomes a vigilante assassin and sets out to unleash his wrath upon the corrupt businessman who slaughtered his entire family. Given the dominance of the Marvel Cinematic Universe (MCU), it feels strange to remember the days when movies based on DC Comics characters dominated the box office. 2002�s Spider-Man firmly altered this equation, but with era-defining hits like 1978�s Superman and 1989�s Batman, DC dominated in the 20th century. Actually, Marvel barely even tried to compete with DC back then, a fact demonstrated in 1989. While Batman became the year�s biggest hit, Marvel responded with The Punisher, a flick with such tepid commercial prospects that it didn�t even run theatrically in the US. In the more favorable climate of 2004, Marvel gave the franchise another shot via a reboot logically titled The Punisher. With a worldwide take of $54 million, it didn�t exactly dominate at the box office, but at least it showed up on movie screens, an improvement over its 1989 predecessor. FBI Agent Frank Castle (Thomas Jane) retires to spend more time with his wife Maria (Samantha Mathis) and young son Will (Marcus Johns). However, this idyllic period ends when criminal kingpin Howard Saint (John Travolta) delivers violent retribution for the death of his son Bobby (James Carpinello). This leaves Frank in bad shape and his family slaughtered. 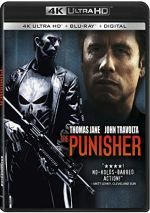 Despondent about his loss, Frank adopts the vigilante persona of �The Punisher�, a one-man judge/jury/executioner who sets out to take down Howard Saint. 20 years ago, Jane seemed destined for major stardom. He boasted leading man looks and enough talent that he felt like an actor who should�ve made the leap to �A-list� status. Alas, that never occurred. Jane has maintained a perfectly credible career, but real fame escaped him. Perhaps this occurred because he got stuck in mediocre projects like Punisher. While this never turns into a bad movie, it also fails to boast any real strengths to elevate it. 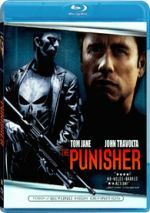 Punisher comes with a standard issue �lone vigilante out for revenge� plot, one with clear Western overtones. As trite as so many of the story�s elements may seem, they still come with the potential to create a reasonably involving drama if put into the right hands. I guess those hands weren�t Jonathan Hensleigh�s. Best-known as the writer of 90s hits like Die Hard With a Vengeance and Jumani, Punisher marks Hensleigh�s directorial debut, and he doesn�t bring a lot of creativity to the proceedings. Punisher often feels �paint by numbers�, as it follows predictable paths with predictable characters and predictable scenarios. This would become less of an issue if the film managed to show a pulse, but since it seems so bland and ordinary that it never threatens to deliver much in terms of excitement. As for the cast, they offer respectable performances, though tone varies a lot and impacts their effectiveness. Punisher seems unsure of how gritty it wants to be, so it tosses out incongruous comic relief too often. These moments subvert the drama. Not that Punisher needs to offer unrelenting doom �n� gloom, but a greater sense of commitment to darkness would make it more effective. All of this leaves Punisher as a wholly mediocre film. 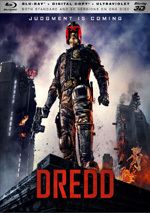 It brings just enough violent action to keep the audience with it, but the viewer seems likely to lack real engagement in the story and characters most of the time. The Punisher appears in an aspect ratio of approximately 2.35:1 on this Blu-ray Disc. This was one of the very first Blu-rays ever released back in June 2006, and it showed its age. That said, the image held up better than expected, as it didn�t fall to the depths of the early period�s worst discs. Still, the Blu-ray clearly lacked the strengths of the format. Overall sharpness tended to seem mediocre. For the most part, the movie offered passable delineation, but the picture never imparted particularly strong definition, so a general sense of dullness pervaded the film�s look. Jagged edges and shimmering remained minor at worst, and edge haloes stayed modest as well. Print flaws appeared sporadic, as occasional instances of specks and marks materialized. These didn�t become a real problem, though. Punisher came with a lot of grain, so much that I suspected some � or much � of the �grain� actually stemmed from digital noise. The level of this issue varied, but the image seemed messier than I�d expect. Despite the movie�s grim subject matter, the palette came with bright hues on occasion, mainly when Frank attended his family reunion. That said, even at their best, the colors lacked much vivacity. They didn�t appear bad, but they failed to deliver the expected range and impact. Blacks felt mediocre, as they veered toward the inky side of the street, and shadows remained flat and a bit drab. Again, this wasn�t a terrible presentation, but it felt relentlessly mediocre. Though the film�s DTS 6.1 ES soundtrack fared better, it came across better than the picture, but it didn�t seem quite as engaging as one might expect from a movie with so much action. To be sure, the scenes with gunfire, explosions and car chases contributed a positive sense of activity and used the various channels in a satisfactory manner. However, I thought an uber-violent story like this would boast more auditory kick. While the soundscape created a more than acceptable sense of place and action, it just lacked the involvement and power it needed. Audio quality seemed fine. Speech felt natural and concise, without edginess or other concerns. Music offered good range and punch, while effects brought out vivid, accurate information that included pretty positive low-end. All of this was strong enough for a slightly disappointing �B�. Also on Lionsgate provides a general promo for Lionsgate Blu-ray titles. No trailer for Punisher or other extras appear here. As a violent, �R�-rated tale, The Punisher delivers intermittent thrills at best. While it gives us the occasional impactful moment, too much of it feels generic and forgettable. The Blu-ray brings pretty good audio but visuals barely seem mediocre and we get no supplements. This becomes a drab release for a bland movie.